This is the 3rd and last part in a series of lessons on how to construct different 3 note chords. If you have not read the following lessons, they are prerequisites to understanding this lesson. Chord Construction - 3 Note Chords - Part 2 - Learn how to spell any major, minor, augmented, diminished, sus2 and sus4 chord. Once you understand the basic concept of what chord formulas are and how to spell different 3 note chords, your next step is to use this information to decode some of the chord forms that you already know. 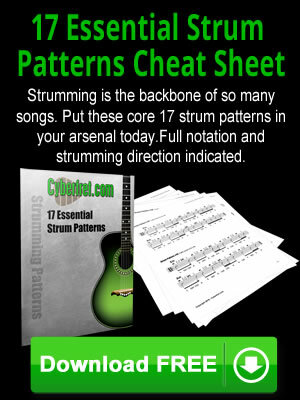 Then you can use your knowledge of music theory to alter them into other chord types. First, this is going to be very difficult for you to do if you are not familiar with the names of the notes on the neck of the guitar. So if this is a weak point for you ....STUDY THEM. Knowing the names of the notes on the neck of the guitar is a prerequisite to being able to apply music theory. For the next part of this lesson I am going to use horizontal chord charts. They are just a little easier to deal with in expressing the information than creating all of the traditional chord graphics that would be necessary. Below is how the horizontal chord charts are read.